Every Month and you can choose either specific Science Fiction, Fantasy, or surprise me. I bought a "Surprise Me" box. It ships on during the first week of the month and took literally two days to get to my US mailbox. 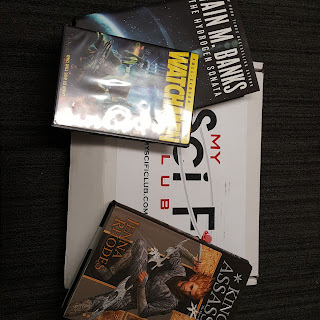 Because My SciFi Club is connected to CrateJoy, the ordering process is really easy. Especially if you use CrateJoy often, then it saves all your information. The month I bought had two books and a movie, which is typical for each month. They don't go by themes, but rather send out random books. The problem? Because they send random books (that clearly were from a discount place) it doesn't mean you will get the first in a series. I actually received the third in a trilogy and the tenth in a series so it wasn't really helpful for me. Sure, I only had to pay like $30 and got a lot of stuff, but now I have to go out and find the other books in the series to be able to read it! That's not a bargain for your buck.